2017 marks the 50th anniversary of the inauguration of what is perhaps the most famous geodesic dome in the world: the US Pavilion at Expo 67, designed by R. Buckminster Fuller and Shoji Sadao. From first experiments undertaken in the late 1940s through to the proliferation of DIY domes in the early 1970s, the UQAM Centre de design exhibition Montréal’s Geodesic Dreams explores the “geodesic moment” in architecture. Opening on September 20, the exhibit will run until December 20, 2017. The exhibition is curated to reveal the forgotten role of Montréal and Québec in the development of this innovative structural system that captured the 20th-century architectural imagination. Photographs, drawings, books, documents, drawing instruments and design tools on loan from the Fonds Jeffrey Lindsay of the University of Calgary’s Canadian Architectural Archives and various other archives and collections will highlight the intricacy of those spherical structures. The exhibition will also feature a series of models, structural details at 1:1 scale, and a prototype 20’ diameter geodesic dome designed and built by Studio Cube with a team of students from UQAM’s École de design. The exhibition focuses on the work of the Montréal designer Jeffrey Lindsay (1924-84), founder and director of the Fuller Research Foundation Canadian Division based in Montréal between 1949 and 1956. His numerous projects will be presented, including several geodesic domes constructed on the Island of Montréal and its environs, among them “Weatherbreak” (1949-50) the first self-supporting, large-span geodesic dome ever built according to Fuller’s designs, which was assembled in Baie D’Urfé; “Skybreak” in Beaurepaire (1951); “Skigloo,” a chalet in Morin Heights (1952); and the Hackney Barn in Senneville (1952-54). 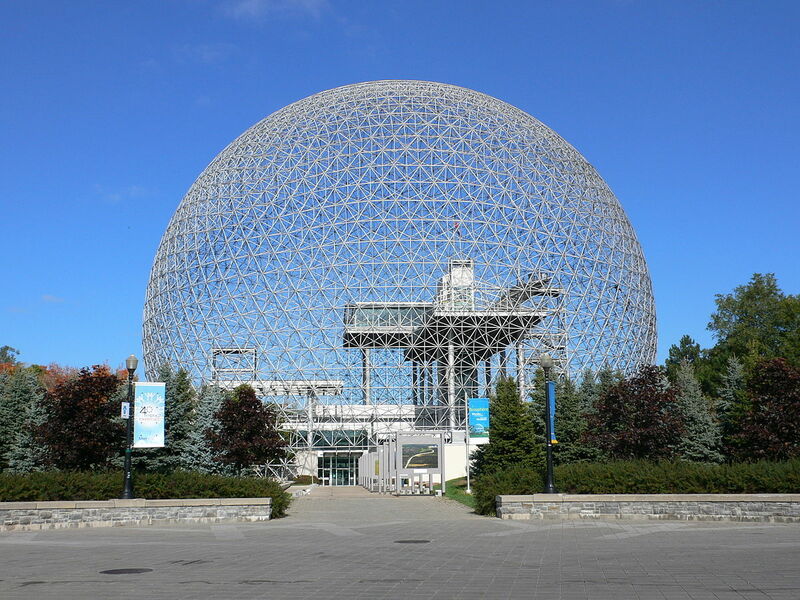 The exhibition will also explore the diffusion of the geodesic dome in Québec, ranging from the polar bear enclosure at the Granby Zoo (Paul O. Trépanier and Victor Prus; 1962-63) to the dome of the US Pavilion at Expo 67. A bilingual catalogue accompanying the exhibition will be published by Dalhousie Architectural Press in mid-October. The exhibition is realized in collaboration with the University of Calgary’s Canadian Architectural Archives.